Abstract: A multi-bay backplane module is a box the size of a couple optical drives stacked on top of one another that stores a handful of serial ATA hard drives in compact, individually hot swappable drive caddy's. The IcyDock MB453SPF-B SATA hard drive module will accommodate most PC chassis configurations, but there are at least two critical areas which may conflict with some chassis designs. The length of the MB453SPF-B with and without the fan module attached is 180mm and 220mm respectively. The unit is the same size as an optical drive without the fan hooked up, but slightly longer with it attached (it sticks out 40mm, and is 85mm square). Full size desktop computer cases are most likely to accommodate the IcyDock MB453SPF-B with its cooling system, but compact desktop, mid-tower and small form factor cases may not. Now there are about as many ways of installing a 5.25" device into a PC chassis as there are computer cases in the world, but with all this variety there is a grain of standardization at the hart of each method. After all, each case must accommodate an equally sized 5.25" x 1.75" metal box right? Rail systems, quick clips, locking tabs, post and screw.... the varieties are endless. The critical aspect that may affect the IcyDock MB453SPF-B's usefulness in your computer chassis are the supports which hold the 5.25" devices in place, in the bay area. So long as the little metal tabs protrude no more than 5mm (3/16") the IcyDock unit will slide in smoothly. A groove runs along the center-line of the aluminum box to accommodate this very component of chassis designs. If the optical drive bays are individually split up, or have metal support tabs which stick out further than that, the IcyDock box won't have the space it requires. 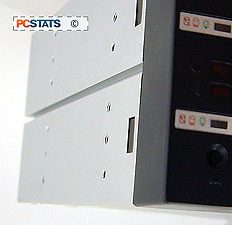 PCSTATS would generally recommend installing the IcyDock MB453SPF-B at the top of the stack of 5.25" drive bays, so the cumulative heat generated by three spinning hard drives will have the shortest path to the powersupply where it can be exhausted from the case. 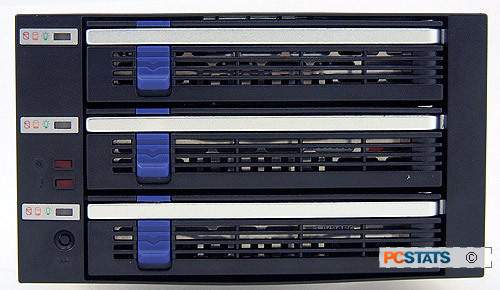 Reassuringly, the three SATA drive caddy's are keyed so there is no way you can install them incorrectly. The hard drives are held in place with special countersunk #6-32 screws, so try to resist the temptation of loosing them. A few extra screws are tossed in, which is good because they're hard to find and the caddy won't fit in with standard computer case screws. Pg 4. Paperweight or Handy Peripheral?